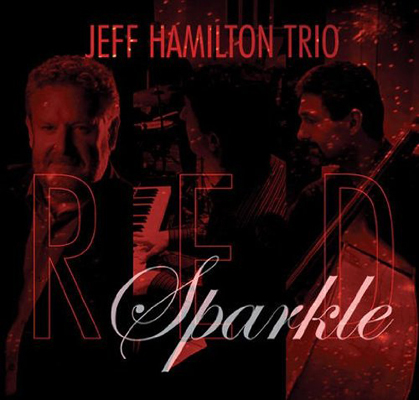 Unless you’re way out of touch, you know that the Jeff Hamilton Trio is the best small-jazz unit in today’s music world. Not long ago, that accolade applied to groups headed by Bill Evans, Oscar Peterson, Ray Brown and Gene Harris ... but since their passing, Hamilton’s trio stands alone. Bassist Christoph Luty came to Los Angeles from Salt Lake City in 1990, so he could “play with the greats. He and Hamilton have worked with many of the same individuals and groups: a clear explanation for their close alliance. Tamir Hendleman, a prodigious, Israeli-born pianist, is the relative youngster in the trio; he joined in 2000. Once again, an examination of his career experience reveals a path closely allied with his trio colleagues; all three are members of the Clayton/Hamilton band, and have been members of various groups that have supported icon vocalists. The 10 tracks here cover the jazz waterfront. Four are group originals: Hamilton contributed “Ain’t That a Peach” (a tribute to Snooky Young, who was part of the Clayton/Hamilton band for years) and “Red Sparkle” (the color of Jeff’s first drum set). Luty composed “In an Ellingtone,” and Hendleman and Hamilton produced “Hat’s Dance.” The rest of the menu consists of standards by Johnny Mercer, Harold Arlen, Ray Brown and others. As arranged and delivered here, they’re all winners. This isn’t the first album by this trio, and I’m sure it won’t be the last. And, like all the others, it’s a great keeper. This album once again demonstrates what can happen when a group of talented musicians — pursuing their own careers in the New York City area — get together and produce some really nice jazz. The summer after high school, Wilensky heard that Ray Charles was looking for a lead alto; the young saxman auditioned and got the job. Wilensky eventually moved to New York, where he has been working steadily. 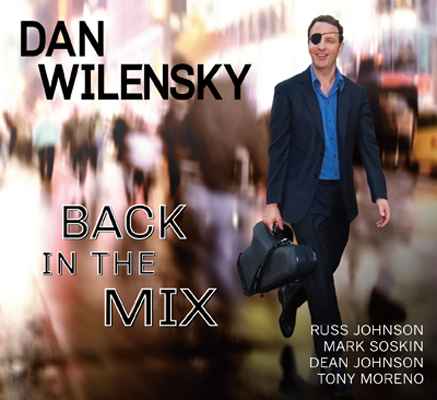 Back in the Mix features his regular quintet: pianist Mark Soskin, bassist Dean Johnson, drummer Tony Moreno and trumpeter Russ Johnson. All these musicians are first-call artists: Soskin has worked with Sonny Rollins, Randy Brecker and Herbie Mann; Dean Johnson has played with Lee Konitz, Dave Grusin, Joe Lovano and Gerry Mulligan (the latter during a 10-year period). Moreno is one of the most sought-after percussionists in the New York area. while Russ Johnson currently tours with Konitz and is on the faculty at Queens College. Six of these nine tracks are originals by Wilensky, and he arranged the remaining three standards: Cole Porter's "Falling in Love with Love," Gross & Lawrence’s "Tenderly" and J.J. Johnson’s "Lament." The result is a smooth mix of balladic and mid-tempo tunes: a pleasure to hear and (surprise!) quite danceable. The melodic lines and variations are established by the sax and trumpet duo, supported ably by the solid rhythm section. Each artist has opportunities to solo, and the results are innovative and excellent. This relaxed group will hold your attention and — if the venue permits — encourage you to don those slow-dancing shoes ... and we don't get nearly enough opportunities for the latter these days. 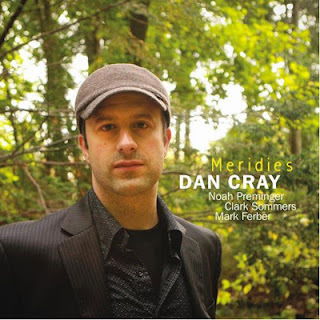 Origin Records always finds promising new jazz musicians; pianist Dan Cray, one of the youngest to come along in awhile, is the most recent example. He’s in his mid 30s, graduated from Chicago’s Northwestern University in 1999, and currently is working on a master’s degree at New York University, where he’s also a member of the faculty. He was a finalist in both the 2003 Monterey Jazz Festival Solo Piano Competition and the 2004 American Pianists Association Cole Porter Fellowship. He has worked steadily with his trio for more than a dozen years, initially in the Chicago area, and then around New York City. For Meridies, his fifth album, he added tenor saxman Noah Preminger to his basic trio compatriots: bassist Clark Sommers and drummer Mark Ferber. I love jazz trios, but the addition of another instrumentalist always adds value to the group; the associated arrangements are more complex, and the interplay among the artists tells you more about their capabilities, than is revealed in melodic lines and solos. Cray is an excellent composer, in addition to his talents as an artist and arranger. He wrote six of these eight tracks; the exceptions are Charlie Chaplin’s “Smile” and Joe Henderson’s “Serenity.” The introductory chords of “Smile,” the album opener, give clear evidence that Cray’s arrangements lean toward a level of imagination and complexity that go beyond the basic melody. “Smile” is a “simple” tune that can be repeated after a single hearing, but this group’s interpretation makes much more out of it. The same can be said of the rest of the menu. The observation that “these artists think together” certainly isn’t original, but it’s certainly true here. Two tracks are done as ballads; the rest are mid-tempo. Most importantly, all of them swing nicely. I love the sound that Preminger gets from his tenor sax; it’s smooth and warm, and reminiscent of Warne Marsh and Stan Getz. The piano, bass and drums work together effectively and beautifully. I expect to hear a lot more from Mr. Cray and his associates. Tommy Igoe has been a drummer since he was 2 years old. It helped that his father also was a drummer — who played with Benny Goodman and Woody Herman — and Tommy was fortunate to have been born and raised in New Jersey. For musical purposes, that’s essentially a suburb of New York City, which everyone knows is the capital of the jazz world. True, Igoe studied classical and jazz piano for 15 years, but that was just an adjunct to his love for the percussion instruments. By age 18, he was playing with the Glenn Miller Orchestra; in 1986, he was a member of the Blood, Sweat and Tears touring band. Igoe also worked for Stanley Jordan, Art Garfunkel and Dave Grusin, and in ’97 was asked to help create the drum set “book” for the Broadway production of The Lion King. A significant part of his career is dedicated to teaching, and he has written numerous instruction books — and released DVDs — that deal with drumming. 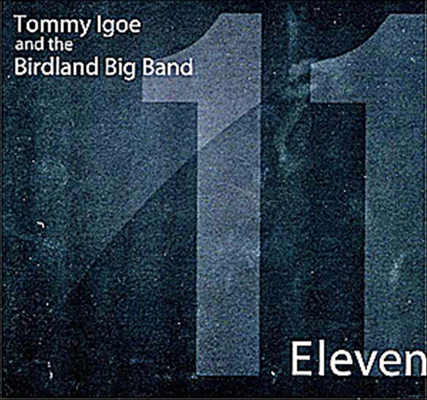 His newest project is the Birdland Big Band, which has a weekly gig at New York’s Birdland jazz club. That unit, featured on this CD, is a big band in every sense of the word; the cadre includes five trumpets, three trombones, five reeds and a rhythm section of piano, bass and drums (the latter role filled by Igoe, of course). Three additional guests appear: a harmonica player, another pianist and an additional percussionist. This album’s title, Eleven, relates to the number of tracks. Four were written by icons Chick Corea (“Armonda’s Rhumba” and “Got a Match”), Michael Brecker (“Spherical”) and Herbie Hancock (“Butterfly”); the rest come from lesser known — but equally talented — jazz composers. It goes without saying that personnel from the Big Apple’s huge jazz population are willing to stand in line to be a part of this organization. A number of descriptive terms come to mind when listening to this album: swinging is one; precise is another. I’d expect nothing less; you’re hearing the cream that rises to the top of New York’s jazz artists. Everyone clearly is having a ball, and so will you. A side note: After his years on the East Coast, Igoe has relocated his family to San Francisco. Jazz fans will love him there, as well. 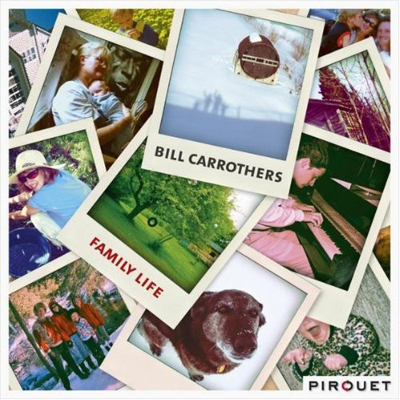 When Carrothers isn’t touring, playing at jazz festivals or concerts, he’s at home in rural Mass City, Michigan, where he’s truly at peace. As he describes himself, “I’m a jazz piano player ... but I’m a wanna-be baseball player ... and an addicted snowmobile rider.” He’s also clearly a dedicated family man; consider some of this release’s song titles: “Our House,” “Northern Lights,” “Snowbound,” “Forefathers,” “A Night Out,” “Good Dog” and “News From Home.” (You get the idea.) The tunes are short, ranging from 3 to 5 minutes, and each one obviously relates to events in Carrothers’ daily life that make -- and keep -- him happy. Family Life doesn’t swing like Joy Spring and A Night At The Village Vanguard, but the happiness Carrothers experiences in his personal life is contagious, and it will affect you. This is an excellent album, done by a master artist. Turn Signal emanates from the San Diego region of Southern California, and the album is chaperoned by pianist Mike Wofford and flautist Holly Hoffman. Wofford is the elder statesman, dating back to the time of the Lighthouse All Stars, Zoot Sims, Art Pepper, Shelley Manne and their contemporaries; Hoffman, after years of study in the classical genre, fell in love with jazz and began working with artists such as Bob Magnusson, Bill Cunliffe, Ray Brown and Mike Wofford, whom she married in 2000. They have played together ever since. Trumpeter Terell Stafford, bassist Rob Thorsen and drummer Richard Sellers belong to the later generations of jazz artists. Stafford, mentored by Wynton Marsalis, gained experience with the likes of Bobby Watson, Benny Golson, Kenny Barron and Jon Faddis. Thorsen tried many instruments — ukulele, guitar, flute, sax, tuba and electric bass — during high school, before settling on the acoustic bass. Drums have been a constant for Sellers, who also lead his own steel band. The tracks here relate to “favorite artists” with whom Wofford and Hoffman have worked during their careers, or to events and things that have been special for them. Hoffman’s “M-Line” — the album’s up-tempo burner — refers to their dog, Emily, whose namesake is guitarist Emily Remler. 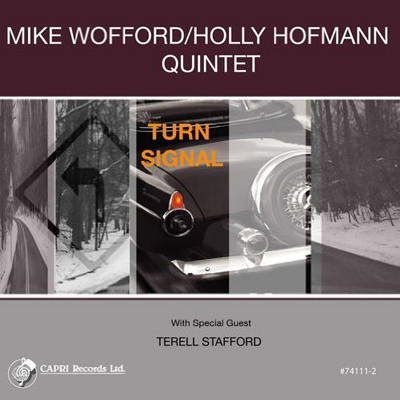 Wofford wrote “The Dipper” as a tribute to Horace Silver; “Soul Street,” a chart done by Jimmy Forest, evokes Wofford’s time with Oliver Nelson. “Esperança,” written by Vince Mendoza, is one of Hoffman’s favorites; “The Girl from Greenland” honors the memory of pianist/composer Richard Twardzik.